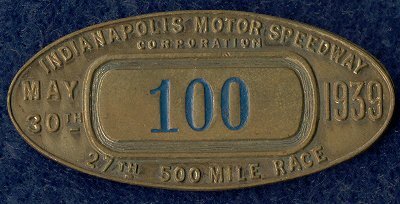 From 1938 through 1941 and 1946, it is believed there were 500 or less pit badges made from each year and there is just one badge i.e. there was not a Bronze or Silver badge as we see today. Known as the "Big 5", the 1938 through 1946 badges are extremely hard to find and expensive. All badges from 1938-41 and 1946 have a type of "safety pin" to attach to ones clothing verses a clasp and pin which was introduced in 1947. 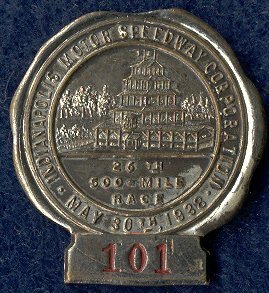 The 1938 badge, made by the St. Louis Button Co., depicts the Pagoda at center and is silver in color with red numbers. It measures about 1 1/4" x 1 1/4" in size. 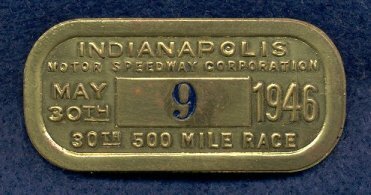 The 1939 badge has a flattened penny appearance and is brass in color with blue numbers measuring nearly 2" x 1". Due to the poor strike on the back of the few 1939 badges seen, the “St. Louis Button Co.” mark on the back is very hard to read. Made by the G.J. Mayer Co. of Indianapolis, the 1940 badge sort of has a "fluffy cloud" appearance and is brass in color with dark highlights and red numbers measuring 1 2/3" x 1 3/5". Note that the company name is upside down in orientation to the badge. The 1941 badge is again made by the G.J. Mayer Co. and is a bright silver in color with reddish orange colors for the numbers. The badge measures 2” x 1” and is slightly curved. 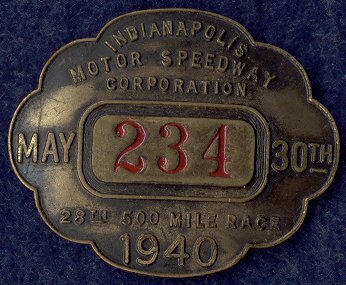 The 1946 badge is brass in color with blue numbers and is in the shape of an oval just like the Speedway. Like the 1941 badge, the 1946 badge is also slightly curved and measures a little over 2" x 1". There is no makers name or logo present on the back.